Home » Uncategorized » Rrtizan Snorkel Vest, The Best Snorkel Vest? Snorkeling is one of the most fun activities you can do beneath the surface of the water. You can discover schools of beautiful fish, explore the rocks and caves that many creatures call home, or just float along in the water. With most activities though, there is a level of risk involved with snorkeling, especially if you are uncomfortable in the water, or you are a first-time snorkeler. This is where a snorkel vest comes into play. For our tests, we used this vest in conjunction with our full face snorkel mask review. We wanted to see how useful this vest would be for a beginner snorkeler or someone who feels uncomfortable and uneasy in the water. These vests are primarily designed for safety but are mostly used by beginners, as they allow you to achieve the ideal amount of buoyancy, and you can spend more time floating and enjoying your dive, instead of worrying about staying afloat. The Rrtizan is designed in the typical horsecollar shape. This design is used most commonly with snorkel vests, although there are hybrid and jacket designs, the horsecollar is the most reliable and most liked design. This design simply means there is one air bladder which is kept in place by adjustable straps around the waist and crotch. These straps ensure the vest stays in place, and doesn’t move to the sides which could cause you to flip if you are hit by a wave. Snorkel can sometimes be a bit tricky to fit, as they don’t like a jacket or t-shirt would. You buy a snorkel vest depending on your weight. Clearly, the main point of the vest is to keep you afloat. We found it quite easy to find the right size vest. You must just remember to consult the sizing and weight chart to determine which one you need. These measurements vary from manufacturer to manufacturer, so always check twice. 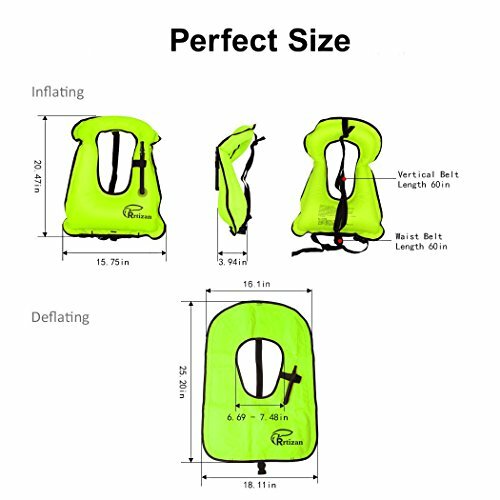 One of the most important aspects of a snorkeling vest is the fastening mechanisms and buckles, these buckles are essential for keeping the vest in place, and therefore keeping the buoyancy in place. The Rrtizan snorkel vest has adjustable weight and crotch straps. These straps allow you to fully adjust the vest depending on your height and weight. It is essential for these straps to fit correctly, and the Rrtizan does this job quite well. Snorkeling vests are inflated and deflated by the wearers’ breath. Inflation is relatively easy, as the tube is located close to the wearer’s mouth, and you can easily inflate it while wearing it. Deflation with the Rrtizan is just as easy, it inflates and deflates in about 10 seconds, and once deflated, it is quite compact and folds into a rectangle about the size of a book. It can fit into your pack, or even a large pocket quite simply. Snorkel vests are designed solely for the purpose of snorkeling. You are able to swim face down in the water and stay afloat easily. These vests must not be confused with life jackets, as life jackets usually inflate to a much bigger size and are designed to save lives. 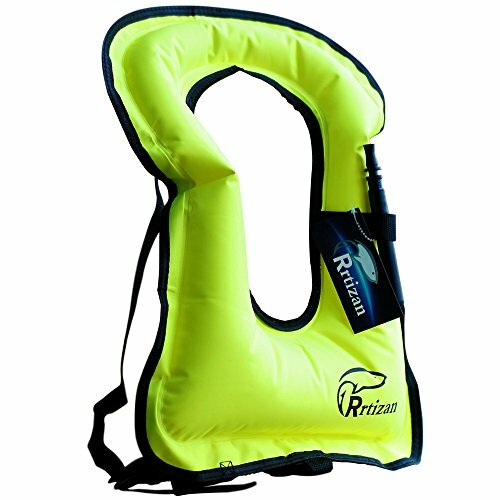 In the case of the Rrtizan Snorkel Vest, it does the job of being an effective snorkel vest incredibly well, but we do not recommend using it for any other water activity, we suggest a life jacket instead if you are needing something for kayaking or rowing. The Rrtizan is made of strong canvas, with a composite PVC membrane. It allows you to bump and graze the vest on rocks or something similar, without suffering enormous amounts of damage. If you are to graze or stab it with force on a sharp point, it will puncture. We suggest staying away from jagged rocks or coral, as they can tear through the canvas. Although this may seem like a big problem, snorkeling in those conditions isn’t common. The Rrtizan is incredibly well priced for what you get. It may not have a whole lot of extras, but to keep you afloat while snorkeling, it does its job brilliantly. Well made fits comfortably, and long-lasting. If you are looking for a reliable snorkeling vest, a vest that will keep you afloat and safe while you are out on the water, whether you are a beginner or expert snorkeler, the Rrtizan is a great choice for you. It may be a simple vest, it may be very easy to use, but don’t let this simplicity and price sway you into thinking it isn’t worth the money. Take it from us, this vest does need any flash to be a great investment.